One of the reasons that learning about branding is so confusing is because people use the words “brand” and “branding” to mean so many different things. Below I’ve listed 13 different definitions of either brand or branding and I think they are all valid definitions. When you read business news, they often refer to companies as brands. For example, Nike, Starbucks, and Target are called brands, but twenty years ago they would have been referred to as companies. Within larger corporations, there are often products or product lines that are referred to as brands. For example, Unilever owns the following brands: Dove soap, Hellmann’s mayonnaise, and Klondike Bars among their many, many brands. Someone who works at Unilever may have the job title of Brand Manager if they directly oversee a certain line of products under one brand name. 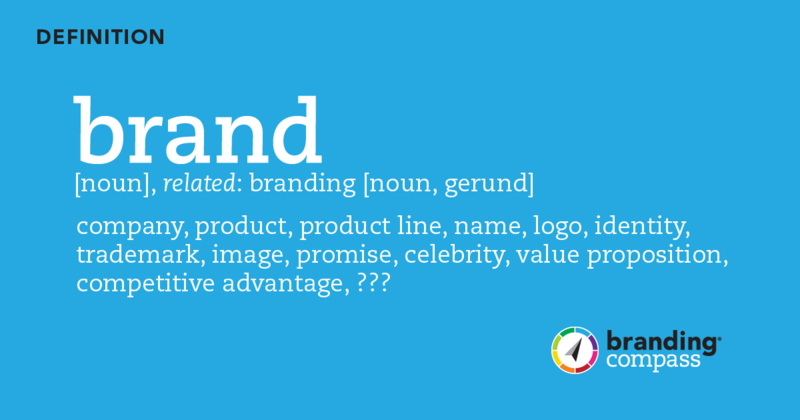 Since a brand can be a company or a product or a line of products within a company, we can also use brand to mean name. In the age of mergers and acquisitions, it can be a more apt way of describing the mix of product lines and companies in one apples-to-apples way. People often call their logo their brand. ‘Nuff said. Just like above, people often refer to their logo as their branding. The word brand can refer to your name, a distinct typesetting of your name, a symbol, slogan, tagline or anything other recognizable visual that can be used as a shorthand to identify your company, product, or service. Expanding on the idea of your brand being the same as your logo. Many people describe their visual identity as their brand image. It tends to incorporate typical visual elements beyond their logo such as their corporate fonts, color palette, packaging, website, and physical space. Some marketers like to get very abstract and say that a brand is a promise. When you hear of a brand, it brings to mind a certain image and that becomes a promise of what to expect. A good example is how the Volvo brand promises safety, whereas as a Hyundai promises affordability. People try and shape their personal brand. For many professionals, their brand is really their reputation and it is formed by how you present yourself, how you speak, how you dress, whether you follow through on promises, your expertise, interests, etc. Some celebrities move from being individuals to acting more like corporate brands. Oprah, Tony Robbins, and Martha Stewart are all great examples of this. Martha Stewart was an individual caterer early in her career, but she grew her business to cookbooks, a magazine and selling home decor and other consumer goods. Clearly, she is not doing all the work herself, but her name is still what sells and represents the promise and expectation of services. In addition, her visual image is still very prominently used. Branding can also refer to identifying how you describe the benefits of your product or service to specifically attract a certain client base or as a way to position your business amongst your competitors. For example, there are likely many features and benefits you offer, but you may highlight certain ones and tell different stories to highlight these particular benefits depending on who you are speaking to. Finding the right angle for your storytelling can be a key part of connecting with your prospective buyers. Branding is often used as a verb to describe the active process of developing your visual identity and messaging. The above list just covers the usage that pertains to identifying and marketing your business. The idea of a brand derives from the symbols people have used for centuries to mark their belongings. According to Wikipedia, the word derives from “the Old High German, brinnan and Old English byrnan, biernan, and brinnan via Middle English as birnan and brond.” People used torches and later branding irons to permanently burn identifying marks into their belongings. The distinct identifying marks came to be associated with a craftsperson’s products or the person, ranch, or company that placed them. The idea of something being “brand new” has to do with it being fresh from the fire.